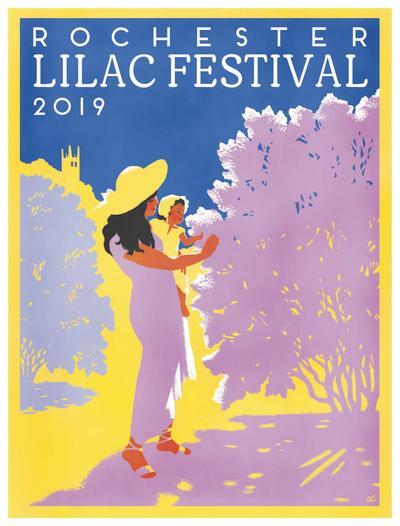 Today the poster for the 2019 Rochester Lilac Festival presented by Five Star Bank, was revealed. This annual moment in time marks the final count-down to the highly anticipated annual event, which is now less than a month away. This year’s poster was commissioned by local artist Alison Coté, who is an award-winning vintage style graphic designer specializing in poster art. Opening Day Celebration – We are happy to announce that we continue our relationship with United Way of Greater Rochester to make Opening Day memorable. We’ll partner with them to help bring awareness to their on-going campaign “Dear Rochester”! You can visit them at the Highland Ave./South Ave. entrance, where they will be showcasing a collage-wall of “Dear Rochester” notes and have a photo booth on-site. Mark Quinn, Superintendent of Horticulture for Monroe County Parks, shared his outlook for the 22 acres of lilacs in Highland Park, the largest collection in North America. "Highland Park&apos;s lilac collection has fared well through the winter. The shrubs are in excellent condition and with the warming spring temperatures the lilacs are on progress toward blooming. We are looking forward to the lilacs providing a fantastic show of color and fragrance in May!" With more than 150 acres of gardens at Highland Park there are a variety of flowers, trees, and plants like sweet magnolias, azaleas, and pansies. “It’s a park for all seasons and all reasons,” said Festival Producer Jeff Springut. The Rochester Lilac Festival has a wide variety of free concerts, with more than 80 musical acts during the 10-day Festival. Visitors are sure to find something the whole family can enjoy. In addition to the major music performances previously announced, many local acts will also grace the Sahlen’s Center Stage. Local performances include: nobody’s marigold, Danielle Ponder and the Tomorrow People, The Medicinals, The Buddahood and many others. "The Lilac Festival is a time-honored tradition that helps to showcase the outstanding quality of life we enjoy here in Monroe County,” said Cheryl Dinolfo, Monroe County Executive. “Over 500,000 visitors to the Festival will make an estimated $3 million impact on our local economy, helping to support more jobs for our friends and neighbors. I&apos;m proud to join our partners and sponsors for another year of free admission and family fun at the 121st Lilac Festival. I look forward to seeing everyone at Highland Park!" The Rochester Lilac Festival is presented by Five Star Bank and hosted by the County of Monroe, the City of Rochester and Visit Rochester.